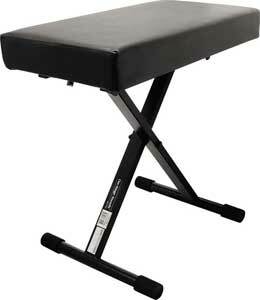 With the 7800+, On-Stage Stands has produced a top-of-the line keyboard bench with quality that's hard to match. The deluxe design combines a 3" cushion which provides deluxe comfort for hours of play. A spring loaded double dead-bolt locking mechanism keeps the bench at your desired height with complete peace-of-mind.